Tallahassee, FL -- An unmistakable Rainbow Wave has brought key victories across Florida and nationwide. 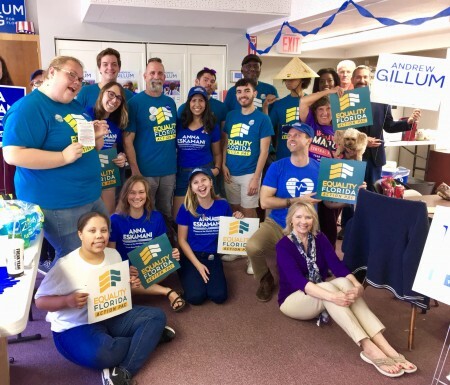 Equality Florida celebrates the record number of LGBTQ victories in an election that put pro-equality Democrats in control of the US House and brought a record number of barrier-breaking victories for women, people of color, and LGBTQ candidates. Nationally, the LGBTQ rights movement protected critical leaders and made transformative gains. US Senator Tammy Baldwin won a competitive re-election campaign. The country’s first LGBTQ Governor Kate Brown won re-election in Oregon, and Jared Polis was elected in Colorado becoming the first gay man in history to take the office of Governor. In Massachusetts, the LGBTQ movement dealt a death blow to anti-transgender attacks by passing Amendment 3 and preserving statewide protections for the transgender community. Florida played a key role in shifting control of Congress by electing two pro-equality Democrats and returning two more in highly competitive races. Congress, held by a Democratic majority, will now serve as a critical check against anti-LGBTQ extremism in Washington, and progress is now possible on national LGBTQ protections. 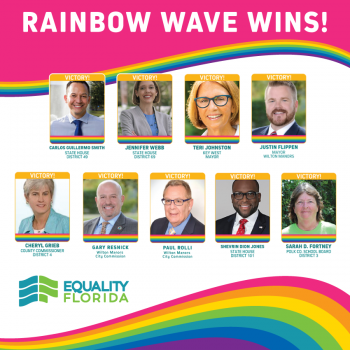 LGBTQ candidates won across Florida. Jennifer Webb became the first openly lesbian representative elected to our legislature, where she joins Representative Carlos Guillermo Smith and Representative Shevrin Jones who both won re-election to boost the number of out LGBTQ state legislators to three. In municipal breakthroughs, Wilton Manors became only the second city in the country with an all LGBTQ commission and mayor. Statewide, 82 of Equality Florida Action PAC’s 111 endorsed candidates won - 74%. Pro-equality Democratic candidates in the Florida House picked up a net gain of between five and seven seats (two seats remain in recount) making the Democratic caucus in Florida’s lower chamber the largest since 1998. And the Florida Senate hosts a clear majority of Senators supporting LGBTQ non-discrimination protections. The 2018 election ends with the largest bipartisan majorities in our history supporting statewide protections for Florida’s LGBTQ community. The call for leadership in both chambers to agenda the Florida Competitive Workforce Act has never been stronger. Finally, down-ballot Amendment 4 passed resoundingly. Florida voters decisively ended Florida’s racist felon disenfranchisement law ensuring millions of more eligible voters in the next 2020 election. 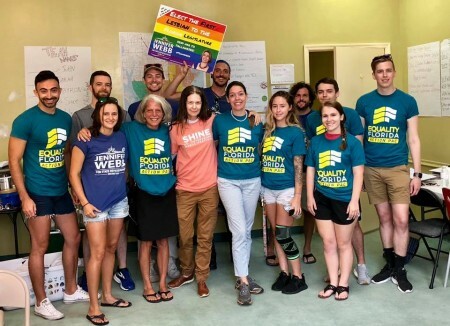 In 2018, Equality Florida launched the most ambitious pro-equality voter turn out program in our history. We targeted 451,000 voters in key districts for whom LGBTQ rights are a litmus test issue. That investment catalyzed the rainbow wave up and down the ballot making possible so many of the game-changing victories in 2018.